I started the day by helping unload the equipment from the car. It was 2:00 in the afternoon and it was pretty hot. I primed the walls in preparation for the little artists. 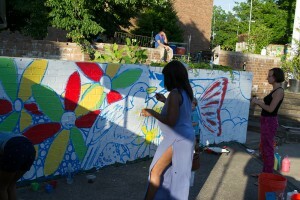 Peter from Albus Cavus outlined birds and flowers to make it easier for kids to start their artistic journey. Exactly at 6pm we opened the gate and greeted our first guests. We had two ladies at the gate. I offered them drinks and we all set in the shade to enjoy the nice afternoon breeze. After a few minutes Tati told me that the two women I was sitting with were world famous and pioneer female skaters Di Dotson and Patti McGee! I was completely blown away. 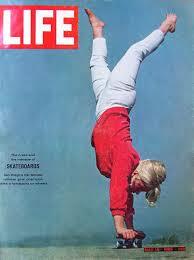 Tati handed me a card that had an old cover of LIFE magazine from 1965 with a girl doing a hand stand on a skateboard. It was Patti McGee! I asked Patti if she would sign it for me and she did it happily! As more and more guests arrived the place began to glow with activity. Most of us were sat at the table area chatting and socializing. As the sun went down and the day cooled off the fireflies came out to play with us. Around that time Bryan Ridgeway, who is responsible for bringing Skateistan to the US, joined us in the festivities. It was such an honor to see Bryan at our event. DJ Mate Masie from Urban Artistry was throwing perfect tunes for the occasion. Several people did break dancing. sPACYcLOUd gave away raffle prizes. 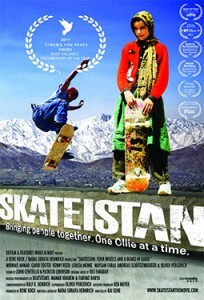 After dark we moved to the lower level to watch the documentary: Skateistan. And boy was it interesting! It was an eye opening experience. It showed us a snick pick into the life of kids in Afghanistan and what they have to go through to get to school or work. Skating took their minds off of the hardships of daily life. Through skateboarding kids made new friends. Skating tied everybody together. Boys and girls, different religions, and different nationalities all came together to skate in peace and harmony. 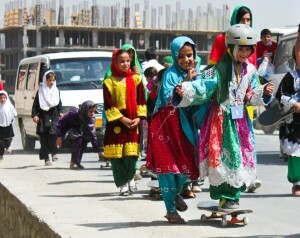 Skateistan is a good example for all of us. We do not need much to create a peaceful and happy community. It takes work but it is very rewarding at the end. 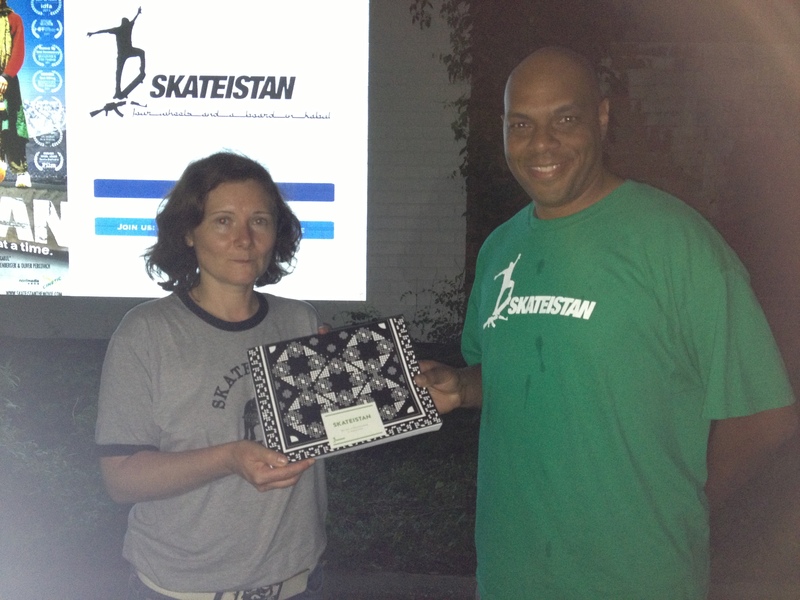 After the movie Bryan presented Tati with a signed copy of the Skateistan book. It was a long and hot day but it was totally worth it. 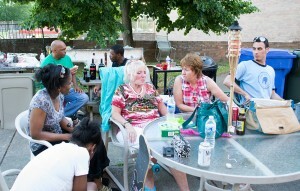 I had such a great time meeting new people and hanging out with old friends. I hope that we do another event like this soon. Till then, keep dreaming the good dream and always remember to follow your heart. It will always lead you in the right direction. Peace.